This article is about the conglomerate company. For the publicly traded company, see Samsung Electronics. For the eSports team, see Samsung Galaxy (eSports). Not to be confused with Samsun, Samson, Sanson, or Sampson. Samsung was founded by Lee Byung-chul in 1938 as a trading company. Over the next three decades, the group diversified into areas including food processing, textiles, insurance, securities and retail. Samsung entered the electronics industry in the late 1960s and the construction and shipbuilding industries in the mid-1970s; these areas would drive its subsequent growth. Following Lee's death in 1987, Samsung was separated into four business groups – Samsung Group, Shinsegae Group, CJ Group and Hansol Group. Since 1990, Samsung has increasingly globalized its activities and electronics; in particular, its mobile phones and semiconductors have become its most important source of income. Notable Samsung industrial subsidiaries include Samsung Electronics (the world's largest information technology company measured by 2012 revenues, and 4th in market value), Samsung Heavy Industries (the world's 2nd-largest shipbuilder measured by 2010 revenues), and Samsung Engineering and Samsung C&T (respectively the world's 13th and 36th-largest construction companies). Other notable subsidiaries include Samsung Life Insurance (the world's 14th-largest life insurance company), Samsung Everland (operator of Everland Resort, the oldest theme park in South Korea) and Cheil Worldwide (the world's 15th-largest advertising agency measured by 2012 revenues). In 1938, Lee Byung-chull (1910–1987) of a large landowning family in the Uiryeong county moved to nearby Daegu city and founded Samsung Sanghoe (삼성상회, 三星商會). Samsung started out as a small trading company with forty employees located in Su-dong (now Ingyo-dong). It dealt in dried-fish, locally-grown groceries and made noodles. 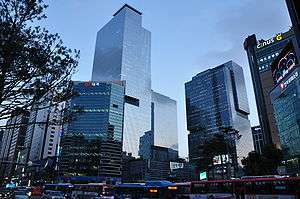 The company prospered and Lee moved its head office to Seoul in 1947. When the Korean War broke out, he was forced to leave Seoul. He started a sugar refinery in Busan named Cheil Jedang. In 1954, Lee founded Cheil Mojik and built the plant in Chimsan-dong, Daegu. It was the largest woollen mill ever in the country. Samsung diversified into many different areas. Lee sought to establish Samsung as leader in a wide range of industries. Samsung moved into lines of business such as insurance, securities and retail. President Park Chung Hee placed great importance on industrialization. He focused his economic development strategy on a handful of large domestic conglomerates, protecting them from competition and assisting them financially. Samsung became the world's largest producer of memory chips in 1992 and is the world's second-largest chipmaker after Intel (see Worldwide Top 20 Semiconductor Market Share Ranking Year by Year). In 1995, it created its first liquid-crystal display screen. Ten years later, Samsung grew to be the world's largest manufacturer of liquid-crystal display panels. 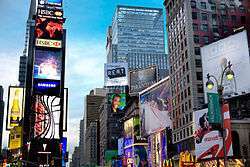 Sony, which had not invested in large-size TFT-LCDs, contacted Samsung to cooperate, and, in 2006, S-LCD was established as a joint venture between Samsung and Sony in order to provide a stable supply of LCD panels for both manufacturers. S-LCD was owned by Samsung (50% plus one share) and Sony (50% minus one share) and operates its factories and facilities in Tangjung, South Korea. As of December 26, 2011, it was announced that Samsung had acquired the stake of Sony in this joint venture. Compared to other major Korean companies, Samsung survived the 1997 Asian financial crisis relatively unharmed. However, Samsung Motor was sold to Renault at a significant loss. As of 2010, Renault Samsung is 80.1 percent owned by Renault and 19.9 percent owned by Samsung. Additionally, Samsung manufactured a range of aircraft from the 1980s to 1990s. The company was founded in 1999 as Korea Aerospace Industries (KAI), the result of merger between then three domestic major aerospace divisions of Samsung Aerospace, Daewoo Heavy Industries and Hyundai Space and Aircraft Company. However, Samsung still manufactures aircraft engines and gas turbines. 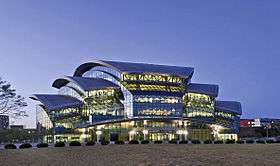 In 2000, Samsung opened a computer programming laboratory in Warsaw, Poland. Its work began with set-top-box technology before moving into digital TV and smartphones. As of 2011, the Warsaw base is Samsung's most important R&D center in Europe, forecast to be recruiting 400 new-hires per year by the end of 2013. In first quarter of 2012, Samsung Electronics became the world's largest mobile phone maker by unit sales, overtaking Nokia, which had been the market leader since 1998. On 21 August's edition of the Austin American-Statesman, Samsung confirmed plans to spend 3 to 4 billion dollars converting half of its Austin chip manufacturing plant to a more profitable chip. The conversion should start in early 2013 with production on line by the end of 2013. On 14 March 2013, Samsung unveiled the Galaxy S4. On August 24, 2012, nine American jurors ruled that Samsung had to pay Apple $1.05 billion in damages for violating six of its patents on smartphone technology. The award was still less than the $2.5 billion requested by Apple. The decision also ruled that Apple did not violate five Samsung patents cited in the case. Samsung decried the decision saying that the move could harm innovation in the sector. It also followed a South Korean ruling stating that both companies were guilty of infringing on each other's intellectual property. In first trading after the ruling, Samsung shares on the Kospi index fell 7.7%, the largest fall since 24 October 2008, to 1,177,000 Korean won. Apple then sought to ban the sales of eight Samsung phones (Galaxy S 4G, Galaxy S2 AT&T, Galaxy S2 Skyrocket, Galaxy S2 T-Mobile, Galaxy S2 Epic 4G, Galaxy S Showcase, Droid Charge and Galaxy Prevail) in the United States which has been denied by the court. Samsung plans to launch a new set of services beginning early 2015. The goal of this new suite of business offerings, dubbed Samsung 360 Services, is to become a help desk of sorts for businesses IT departments. The customizable services range from technical support to security solutions for having a Samsung employee embedded in a client's business as an on-site support manager or technology consultant. Samsung Electronics Inc. is expanding in Silicon Valley with a $300 million facility in San Jose, California. The 10-story complex will include 1.1 million square feet of floor space, a clean room for semiconductors and a "fitness center in the sky". The facility will be split between semiconductor research and development and other sales and marketing functions. It will serve as the North America headquarters for semiconductor operations. In 2015, Samsung has been granted more U.S. patents than any other company - including IBM, Google, Sony, Microsoft and Apple. The company received 7,679 utility patents through Dec. 11. In January 2016, Samsung announced it will be working with Microsoft to develop IoT devices based on Windows 10, where the companies will work together to develop products that will run on the platform, as well as integrate with other companies developing hardware and services on Microsoft's OS. In 1992, American fashion entrepreneur Daymond John had started the company with a hat collection that was made in the basement of his house in the Queens area of New York City. To fund the company, John had to mortgage his house for $100,000. With his friends J. Alexander Martin, Carl Brown and Keith Perrin, half of his house was turned into the first factory of FUBU, while the other half remained as the living quarters. Along with the expansion of FUBU, Samsung invested in FUBU in 1995. On 18 February 2015, Samsung acquired U.S. based mobile payments firm "LoopPay" - This allows Samsung in smartphone transactions. In FY 2009, Samsung reported consolidated revenues of 220 trillion KRW ($172.5 billion). In FY 2010, Samsung reported consolidated revenues of 280 trillion KRW ($258 billion), and profits of 30 trillion KRW ($27.6 billion) (based upon a KRW-USD exchange rate of 1,084.5 KRW per USD, the spot rate as of 19 August 2011). However, it should be noted that these amounts do not include the revenues from all of Samsung's subsidiaries based outside South Korea. Samsung Everland engages in an array of services closely associated with the day-to-day lives and business operations of its customers. Its business scope covers the three main sectors of Environment & Asset, Food Culture and Resort. Since its inception in 1963 and the launch of theme park "Everland" in 1976, Samsung Everland has steadily built its presence across the markets of golf, building management, food and beverage, energy and environment. Through this process, Samsung Everland has managed to achieve its current market standing. As a corporation trusted by the local community and renowned globally as a pioneer in the infrastructure of life, Samsung Everland strives to help its customers lead fulfilling lives and achieve success in their business operations by building the infrastructure for every aspect of life including entertainment, culinary and business. Samsung Fire & Marine Insurance is a multinational general insurance company headquartered in Seoul. 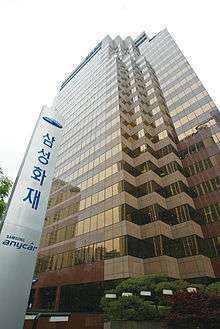 It was founded in January 1952 as Korea Anbo Fire and Marine Insurance and was renamed Samsung Fire & Marine Insurance in December 1993. Samsung Fire & Marine Insurance offers services including accident insurance, automobile insurance, casualty insurance, fire insurance, liability insurance, marine insurance, personal pensions and loans. As of March 2011 it had operations in 10 countries and 6.5 million customers. Samsung Fire & Marine Insurance had a total premium income of $11.7 billion in 2011 and total assets of $28.81 billion on 31 March 2011. It is the largest provider of general insurance in South Korea. Samsung Fire has been listed on the Korea Exchange stock-exchange since 1975 (number 000810). Samsung SDI is listed on the Korea Exchange stock-exchange (number 006400). On 5 December 2012, the European Union's antitrust regulator fined Samsung SDI and several other major companies for fixing prices of TV cathode-ray tubes in two cartels lasting nearly a decade. SSDI also builds lithium-ion batteries for electric vehicles such as the BMW i3, and acquired Magna Steyr's battery plant in 2015. SSDI began using the "21700" cell format in August 2015. Samsung plans to build a factory in Hungary to supply 50,000 cars per year. Samtron was a subsidiary of Samsung until 1999 when it became independent. After that, it continued to make computer monitors and plasma displays until 2003, Samtron became Samsung when Samtron was a brand. In 2003 the website redirects to Samsung. The Hotel opened in March 1979, following the intention of the late Lee Byung-chull, the founder of the Samsung Group. Hosting numerous state visits and international events, it has played the role of locomotive for the service industry in Korea with pride and responsibility as "the face representing the Samsung Group" and "the hotel representing Korea". THE SHILLA maintains elegance and a tradition of winning guests' hearts with the aim of becoming "the best hospitality company". By joining LHW, it is on par with the most luxurious hotels in the world. Meanwhile, it has added modernistic design elements on top of the roof called tradition, thus going through changes to make itself a premium lifestyle space. In addition, with its know-how as a service company in the background, it started a duty-free shop business, and has built its image as the best global distribution company. Also, it is expanding its business into commissioned management of fitness facilities with five-star hotels in Korea and abroad as well as into the restaurant business. THE SHILLA promises to be a globally prestigious hospitality company that offers the best value for money by making creative innovations and continuously taking on challenges. Shilla Hotels and Resorts is listed on the Korea Exchange stock-exchange (number 008770). Samsung Air China Life Insurance is a 50:50 joint venture between Samsung Life Insurance and China National Aviation Corporation. It was established in Beijing in July 2005. Samsung Electronics Co. and Samsung Everland Inc. will each own a 40 percent stake in the venture, with Samsung C&T Corp. and Durham, North Carolina-based Quintiles each holding 10 percent. It will contract-make medicines made from living cells, and Samsung Group plans to expand into producing copies of biologics including Rituxan, the leukemia and lymphoma treatment sold by Roche Holding AG and Biogen Idec Inc.
Sermatech owns 51% of its stock, while Samsung owns the remaining 49%. The U.S. firm Sermatech International, for a business specializing in aircraft construction processes such as special welding and brazing. Samsung Life Insurance holds a 37% stake while the Saha Group also has a 37.5% stake in the joint venture, with the remaining 25% owned by Thanachart Bank. Steco Co. is the joint venture established between Samsung Electronics and Japan's Toray Industries in 1995. The government of the Canadian province of Ontario signed off one of the world's largest renewable energy projects, signing a deal worth $6.6 billion to for an additional 2,500 MW of new wind and solar energy. Under the agreement, a consortium led by Samsung and the Korea Electric Power Corporation will manage the development of 2,000 MW-worth of new wind farms and 500 MW of solar capacity, while also building a manufacturing supply chain in the province. The current Samsung logo design is intended to emphasize flexibility and simplicity while conveying a dynamic and innovative image through the ellipse, the symbol of the universe and the world stage. The openings on both ends of the ellipse where the letters "S" and "G" are located are intended to illustrate the company's open-mindedness and the desire to communicate with the world. The English rendering is a visual expression of its core corporate vision, excellence in customer service through technology. The basic color in the logo is blue, which the company has employed for years, symbolizing stability, reliability and corporate social responsibility. Samsung has an audio logo, which consists of the notes E♭, A♭, D♭, E♭. The audio logo was produced by Musikvergnuegen and written by Walter Werzowa. For more details on Samsung's sports sponsorships, see Samsung Sports. Samsung have been the sponsors of Premier League football club Chelsea since 2005, the sponsorship was ended after ten years in June 2015. 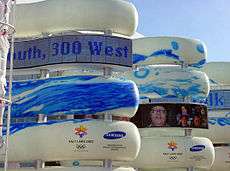 Samsung, which started as a domestic sponsor of the Olympics in Seoul 1988, has been a worldwide Olympic partner since the 1998 Winter Olympics. Samsung operating many sports clubs, football club Suwon Samsung Bluewings, baseball club Samsung Lions, basketball club Seoul Samsung Thunders, volleyball club Daejeon Samsung Fire Bluefangs, etc. Samsung also sponsors a former StarCraft: Brood War and current Starcraft II and League of Legends professional gaming team named Samsung Galaxy. Samsung has sponsored the team since 2000. Samsung Electronics spent an estimated $14 billion (U.S.) – more than Iceland's GDP – on advertising and marketing in 2013. At 5.4% of annual revenue, this is a larger proportion than any of the world's top-20 companies by sales (Apple spent 0.6% and General Motors spent 3.5%). Samsung became the world's biggest advertiser in 2012, spending $4.3 billion, compared to Apple's $1 billion. Samsung's global brand value of $39.6 billion is less than half that of Apple. Samsung is the principal partner of the Sydney Opera House. In April 2016, Samsung were announced as the main sponsor of German Football League team Frankfurt Universe. Of the sponsorship, the Deputy President of Samsung Electronics said "it is important to promote athletic excellence not only in Germany but also in Frankfurt. Therefore we Frankfurt Universe want a great first season in the premier league of GFL". The partnership is for three years. On October 19, 2011, Samsung was fined €145,727,000 for being part of a price cartel of ten companies for DRAMs which lasted from 1 July 1998 to 15 June 2002. The company received, like most of the other members of the cartel, a 10-% reduction for acknowledging the facts to investigators. Samsung had to pay 90% of their share of the settlement, but Micron avoided payment as a result of having initially revealed the case to investigators. Samsung produces printers that are programmed to stop working even though the printer is still working perfectly. There are some work-arounds for users, for instance to more than double the life of the printer after it stops with a message to replace the imaging drum. 1 2 3 "삼성계열사 전자 - 삼성그룹 홈페이지". 1 2 3 4 5 "Samsung Financial Highlights". Samsung Group. Retrieved 2014-05-13. ↑ "Bangladesh and development: The path through the fields". The Economist. 3 November 2012. Retrieved 2 October 2013. Samsung now has around 80 companies and is the world’s largest information-technology firm. ↑ Park, Kyunghee (2009-07-28). "July 29 (Bloomberg) – Samsung Heavy Shares Gain on Shell's Platform Orders (Update1)". Bloomberg. Retrieved 2010-11-11. ↑ "The Top 225 International Contractors 2013". Enr.construction.com. Retrieved 2013-08-25. ↑ "Global 500 2009: Industry: - FORTUNE on CNNMoney.com". Money.cnn.com. 2009-07-20. Retrieved 2010-09-04. ↑ Valhouli, Christina (2002-03-21). "The World's Best Amusement Parks". Forbes.com. Retrieved 2010-09-11. ↑ "Cheil Worldwide Inc (030000:Korea SE)". businessweek.com. Archived from the original on 5 October 2012. Retrieved 2010-09-16. ↑ "Cheil Worldwide (030000 KS)" (PDF). kdbdw.com. 2010-04-26. Retrieved 2013-05-08. ↑ "Samsung and its attractions – Asia's new model company". The Economist. 1 October 2011. Retrieved 11 January 2012. ↑ "South Korea's economy – What do you do when you reach the top?". The Economist. 12 November 2011. Retrieved 11 January 2012. ↑ Hutson, Graham; Richards, Jonathan (17 April 2008). "Samsung chairman charged with tax evasion – Times Online". The Times. London. Retrieved 28 February 2011. ↑ "한국 10대 그룹 이름과 로고의 의미". www.koreadaily.com. 2006-07-10. Retrieved 2010-09-19. ↑ "History – Corporate Profile – About Samsung – Samsung". Samsung Group. Samsung Group. Retrieved 21 October 2015. ↑ "History - Corporate Profile - About Samsung - Samsung". ↑ Ihlwan, Moon (April 22, 2008). "Scandal-Plagued Samsung Chairman Quits". Bloomberg. Retrieved 21 October 2015. ↑ "Industrial giant's roots tied to nylon products". Joongangdaily.joins.com. 2009-11-09. Retrieved 2011-02-05. ↑ "효성 40년史..오너 일가 뒷얘기 '눈길'". www.chosun.com. 2007-06-19. Archived from the original on 1 May 2011. Retrieved 2011-02-05. ↑ "SPC-1000". old-computers.com. Retrieved 19 March 2012. ↑ "Samsung to celebrate 100th anniversary of late founder". koreaherald.com. 2010-03-29. Retrieved 2011-01-21. ↑ "Samsung Austin Semiconductor Begins $3.6B Expansion for Advanced Logic Chips" (PDF). Austinchamber.com. 2010-06-09. Retrieved 2010-09-13. ↑ "Dubai skyscraper symbol of S. Korea's global heights". CNN. 19 October 2009. Retrieved 2009-10-19. ↑ Cho, Kevin (2009-04-24). "Samsung Says Hopes of Recovery Are 'Premature' as Profit Falls". Bloomberg. Retrieved 2010-09-04. ↑ "Samsung buys Sony's entire stake in LCD joint venture". bbc.co.uk. 26 December 2011. ↑ "Samsung Techwin to spin off camera business". reuters.com. 2008-11-06. Retrieved 2011-04-05. ↑ Tchorek, Kamil (1 November 2011). "Samsung: Proud tradition of maths proves a strong draw". The Financial Times. London. Retrieved 28 May 2013. ↑ "Seagate Completes Acquisition of Samsung's Hard Disk Drive Business|Seagate". www.seagate.com. Retrieved 2015-07-14. ↑ "Samsung overtakes Nokia in mobile phone shipments". BBC News. 27 April 2012. Retrieved 6 August 2012. ↑ "Samsung overtakes Nokia for Cellphone Lead". Retrieved 29 April 2012. ↑ Vascellaro, Jessica E.. (2012-08-25) The Wall Street Journal. Online.wsj.com. Retrieved on 2013-03-19. ↑ Samsung bites back after Apple victory – Asia. Al Jazeera English. Retrieved on 2013-03-19. ↑ South Korean court rules Samsung didn't copy Apple's iPhone design. BennyLabamba.com. Retrieved on 24 August 2012. ↑ Samsung Shares Fall After Apple Wins $1 Billion Verdict. Bloomberg. Retrieved on 2013-03-19. ↑ Apple Seeks Ban on Sales of Eight Samsung Phones in U.S.. Bloomberg. Retrieved on 2013-03-19. ↑ Apple Denied Motion for Permanent Injunction. Scribd.com. Retrieved on 2013-03-19. ↑ "Samsung to audit 250 of its suppliers in China amid allegations of child labor violations". CBS News. 4 September 2012. Retrieved 4 September 2012. ↑ "Worried customers clog phones". 3 News NZ. 3 May 2013. ↑ Miyoung Kim (27 November 2013). "Samsung's marketing splurge doesn't always bring bang-for-buck". Reuters. Retrieved 15 December 2013. ↑ "Samsung Music closing July 1". Digital Journal. 20 May 2014. Retrieved 23 May 2014. ↑ dcseifert. "Samsung's Gear VR is a portable Oculus Rift for the Galaxy Note 4". The Verge. Vox Media. Retrieved 31 August 2015. ↑ Lee, Min- Jeong (6 October 2014). "Samsung to Invest $14.7 Billion in New Chip Plant in South Korea". The Wall Street Journal. Retrieved 6 October 2014. ↑ By Cadie Thompson, CNBC. "How Samsung plans to get inside your company." 7 October 2014. 7 October 2014. ↑ By Min-Jeong Lee, The Wall Street Journal. "Samsung to Sell Fiber Optics Business to Corning." 2 December 2014. 2 December 2014. ↑ Jonathan Cheng, The Wall Street Journal. "Look Inside Samsung's New Silicon Valley Headquarters." May 19, 2015. May 19, 2015. ↑ Tood Bishop, GeekWire. “New stats: Samsung surges past IBM to lead U.S. patent race for 2015.” Dec 15, 2015. Dec 15, 2015. ↑ Ingrid Lunden and Frederic Lardinois, TechCrunch. “Samsung Partners With Microsoft For Windows 10 IoT Effort.” Jan 7, 2016. Jan 8, 2016. ↑ Boas, Antonio Villas (June 2, 2016). "Samsung releases truly wireless earbuds". techinsider.io. Retrieved June 4, 2016. ↑ "Samsung buys Swedish wireless chip company Nanoradio". computerworld.com. Retrieved 11 June 2012. ↑ "Voigtländer & Rollei non-camera items". 1997-06-09. Archived from the original on 2011-08-21. Retrieved 2011-02-05. ↑ "Basel 96 Watches Take Back the Spotlight". jckonline.com. June 1996. Retrieved 2011-02-05. ↑ "Samsung Loses Attempt to Acquire Fokker". latimes.com. 1997-01-01. Retrieved 2011-02-05. ↑ "Samsung buys Dutch group in return to M&A". 1997-06-09. Retrieved 2011-02-05. ↑ "FUBU Shoes". shoeshowcase.net. Archived from the original on 24 December 2010. Retrieved 2011-02-05. ↑ "Nomura Wins The Lehman Asia Stakes". Forbes. 2008-09-22. Retrieved 2011-02-07. ↑ "Samsung-Rothschild alliance". koreatimes.co.kr. 2008-11-05. Retrieved 2011-02-07. ↑ Ramstad, Evan (14 December 2010). "Samsung Electronics Buys Ultrasound-Monitor Maker Medison - WSJ.com". The Wall Street Journal. Retrieved 11 February 2013. ↑ Dylan McGrath, EE Times. "Samsung buys MRAM developer Grandis." 2 August 2011. Retrieved 2 August 2011. ↑ Chris Preimesberger, eWeek. "Samsung Acquires New-Gen Memory Maker Grandis." 2 August 2011. Retrieved 2 August 2011. ↑ "Samsung to buy Sony half of LCD venture". 26 December 2011. ↑ Samsung Electronics Acquires Mspot | Mspot. Mspotcorporate.com (2012-05-09). Retrieved on 2013-03-19. ↑ Samsung Electronics Acquires NVELO. Samsung.com (2012-12-14). Retrieved on 2013-03-19. Archived 23 April 2015 at the Wayback Machine. ↑ Samsung Buys Medical Imaging Company NeuroLogica. TechCrunch (2013-01-28). Retrieved on 2013-03-19. ↑ Samsung Acquires SmartThings, A Fast-Growing Home Automation Startup. Forbes (2014-08-14). Retrieved on 2014-08-19. ↑ Samsung buys U.S. air conditioner firm Quietside in 'smart home' push. Foxbusiness (2014-08-19). Retrieved on 2014-08-19. ↑ "Samsung Electronics Acquires Proximal Data". ↑ "Samsung's LoopPay: What it is, and why you should care". CNET. Retrieved 20 February 2015. ↑ By Min-Jeong Lee, The Wall Street Journal. "Samsung's Latest Acquisition: Utah-Based Yesco Electronics." March 5, 2015. March 27, 2015. ↑ Panzarino, Matthew (5 October 2016). "Samsung acquires Viv, a next-gen AI assistant built by the creators of Apple's Siri". TechCrunch. Retrieved 10 October 2016. ↑ Tibken, Shara (15 November 2016). "Samsung's new acquisition will make your texts more interesting". CNET. Retrieved 17 November 2016. ↑ "Samsung refocuses on its core business as it sells security arm Samsung Techwin to Hanwha Group". 1 2 3 "(LEAD) Hanwha wraps up takeover of four Samsung arms". ↑ "Company Overview of Samsung Thales Co., Ltd.". bloomberg.com. Retrieved 21 October 2015. 1 2 Miyoung Kim (17 January 2012). "Samsung Group plans record $41 billion investment in 2012". Reuters. Retrieved 18 July 2013. ↑ "삼성 8년전 타임캡슐 열어보니...지난해 매출 정확히 맞춰". news.naver.com. 2011-01-13. Retrieved 2011-08-22. ↑ "한국경제 大计 기업이 이끈다 지난해 주요그룹 매출 보니". Hankook Ilbo. 2010-07-30. Archived from the original on 28 April 2011. Retrieved 2010-09-04. ↑ Kim Kyung-rok　(2011-04-11). "Chaebol asset holdings swell under Lee administration". hani.co.kr. Retrieved 2011-09-18. ↑ "Samsung's Cheil Industries submits plans for roughly $1.4 billion IPO" (Press release). Reuters. 14 October 2014. ↑ "Samsung Electro-Mechanics Co – Profile". Bloomberg Businessweek. Archived from the original on 5 September 2011. Retrieved 26 August 2012. ↑ Barkham, Patrick (9 August 2012). "Samsung: Olympic smartphone firm aims for big global wins". London: The Guardian. Retrieved 27 August 2012. ↑ "Profile: Samsung Electronics Co Ltd". Reuters. Retrieved 27 August 2012. ↑ "Samsung overtakes Nokia in mobile phone shipments". BBC News. 27 April 2012. Retrieved 27 August 2012. 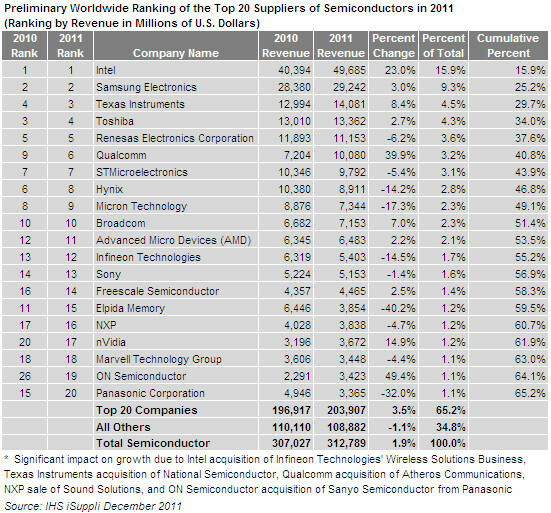 ↑ "Preliminary Worldwide Ranking of the Top 20 Suppliers of Semiconductors in 2011". IHS Isuppli. Archived from the original on 27 June 2012. Retrieved 27 August 2012. ↑ "2011 Financial Statements" (PDF). Samsung Engineering. Archived from the original (PDF) on 5 June 2013. Retrieved 27 August 2012. ↑ "Profile: Samsung Fire & Marine Insurance Co Ltd". Reuters. Retrieved 18 October 2012. ↑ "Corporate Profile". Samsung Fire & Marine Insurance. Retrieved 18 October 2012. 1 2 3 4 "Annual Report 2010". Samsung Fire & Marine Insurance. Retrieved 18 October 2012. ↑ "Company Profile for Samsung Heavy Industries Co Ltd". Bloomberg. Retrieved 27 August 2012. ↑ "Separate Statements of Income Years Ended December 31, 2011 and 2010" (PDF). Samsung Heavy Industries. Retrieved 27 August 2012. ↑ "From bad to worse". The Korea Times. 19 August 2012. Retrieved 27 August 2012. 1 2 3 "2011 Annual Report" (PDF). Samsung Life Insurance. Archived from the original (PDF) on 4 October 2012. Retrieved 28 August 2012. ↑ "Company Profile for Samsung Life Insurance Co Ltd". Bloomberg. Retrieved 28 August 2012. ↑ The Samsung mission Archived 26 August 2014 at the Wayback Machine. ↑ "Philips, LG Electronics, 4 others fined 1.47 billion Euros for EU cartel". The Economic Times. 5 December 2012. Retrieved 5 December 2012. ↑ "Samsung SDI Unveils E-bike Battery Capable of 100km on Single Charge". Be Korea-savvy. 26 August 2015. Archived from the original on 26 December 2015. Retrieved 31 August 2016. ↑ "Samsung SDI to Build Electric Vehicle Battery Plant for European Market". TheStreet. 30 August 2016. Retrieved 30 August 2016. ↑ "South Korea Starts Grain Venture in Chicago to Secure Supply". bloomberg.com. Retrieved 19 March 2012. ↑ "Brooks Automation and Samsung Electronics Announce a Joint Venture". investor.brooks.com. Retrieved 28 March 2012. ↑ "POSCO and Subsidiaries" (PDF). londonstockexchange.com. Retrieved 6 June 2012. ↑ "Insurance joint venture off to flying start". english.sohu.com. Retrieved 19 March 2012. ↑ "Samsung Group, Quintiles Plan $266 Million Venture to Make Biologic Drugs". bloomberg.com. Retrieved 19 March 2012. ↑ "Biogen Idec (NASDAQ:BIIB) and Samsung JV". livetradingnews.com. Archived from the original on 15 June 2012. Retrieved 19 March 2012. ↑ "Biogen Idec and Samsung Bioepis Ink Biosimilar Deal". Gen. Eng. Biotechnol. News (paper)|format= requires |url= (help). 34 (2). 15 January 2014. p. 14. ↑ "Samsung to sell chemicals and defence operations for $1.7bn". Kable. 26 November 2014. Retrieved 6 March 2014. ↑ "Samsung BP Chemicals". BP. Archived from the original on 3 April 2015. Retrieved 6 March 2015. ↑ "Company Overview of Samsung BP Chemicals Co., Ltd.". Bloomberg Business. Bloomberg. Retrieved 6 March 2015. ↑ "Samsung and Sumitomo Chemical to make sapphire substrates for LEDs". ledsmagazine.com. Retrieved 19 March 2012. ↑ "company/introduce". sdflex.com. Retrieved 19 March 2012. ↑ "Samsung Aerospace, Sermatech Launch Korean JV". english.chosun.com. Retrieved 28 March 2012. ↑ "Siam Samsung Life ready to reawaken". bangkokpost.com. Retrieved 19 March 2012. ↑ "Siltronic-Samsung Joint Venture". wacker.com. Archived from the original on 5 October 2012. Retrieved 19 March 2012. ↑ "Completion Ceremony for EDS Production". toray.com. Archived from the original on 30 November 2012. Retrieved 28 March 2012. ↑ "Toray/Samsung JV boosts FPD circuit substrate capacity". electroiq.com. Retrieved 28 March 2012. ↑ "Alpha's demise thwarts Samsung's processor dreams, analysts say". www.eetimes.com. Retrieved 2 April 2012. ↑ "LED EXPO&OLED EXPO 2011 An Interview with GE Lighting". us.GFSSGYG aving.net. Retrieved 2 April 2012. ↑ "Steel firms in B2B venture". money.cnn.com. 10 May 2000. Retrieved 2 April 2012. ↑ "Shipyards in Brazil – Rev. D, June 2010" (PDF). INTSOK. Archived from the original (PDF) on 2 February 2014. ↑ "Milestone launch at Brazil's Atlântico Sul". MarineLog. Retrieved 6 March 2012. ↑ "Company Analysis" (PDF). rdata.youfirst.co.kr. Archived from the original (PDF) on 11 April 2014. Retrieved 19 March 2012. ↑ "Samsung eyes 7.4 percent stake in Gorilla Glass maker Corning". news.cnet.com. Retrieved 23 October 2013. ↑ "Doosan Engine ends 33.2 pct higher on stock market debut". yonhapnews.co.kr. Retrieved 19 March 2012. ↑ "Korea Aerospace sale could prove need for clearer M&A guidelines". privateequitykorea.com. Retrieved 19 March 2012. ↑ "MEMC Korea Company". memc.com. Retrieved 19 March 2012. ↑ "Samsung to buy 10 percent stake in rival Pantech". zdnet.com. Retrieved 23 October 2013. ↑ "Rambus, Inc. RMBS". morningstar.ca. Retrieved 6 March 2012. ↑ "Seagate to Buy Samsung's Hard-Disk Unit for $1.38 Billion, Build Alliance". Bloomberg Businessweek. Retrieved 6 March 2012. ↑ "Samsung buys stake in struggling Sharp". money.cnn.com. Retrieved 23 October 2013. ↑ "Posco Heavy Industries' may be in the works" (PDF). Korea JoongAng Daily. Retrieved 19 March 2012. ↑ "Taylor Energy Sells Gulf of Mexico Assets to Two South Korean Companies". reuters.com. 1 February 2008. Retrieved 19 March 2012. ↑ "Samsung buys five percent stake in stylus-maker Wacom". engadget.com. Retrieved 23 October 2013. ↑ "The Russian offshore project "Sakhalin II" is relying on Arma-Chek R". armacell.com. Archived from the original on 1 May 2011. Retrieved 2011-02-07. ↑ "Samsung Heavy Industries". www.forbes.com. 2009-09-23. Retrieved 2010-09-13. ↑ "Samsung Heavy Signs Deal with Shell to Build LNG Facilities". www.hellenicshippingnews.com. 2009-07-31. Retrieved 2010-09-13. ↑ "Major construction begins on the Prelude FLNG project". 18 October 2012. Retrieved 15 July 2014. ↑ "The gas platform that will be the world's biggest 'ship'". bbc.co.uk. 15 July 2011. Retrieved 19 March 2012. ↑ "Seoul wins 40-billion-dollar UAE nuclear power deal". www.france24.com. 2009-12-28. Archived from the original on 3 March 2011. Retrieved 2010-09-29. ↑ "Korean Companies Anchor Ontario's Green Economy – January 21, 2010". www.premier.gov.on.ca. 2010-01-21. Archived from the original on 15 May 2011. Retrieved 2010-09-13. ↑ Samsung 1993. Corporatebrandmatrix.com (2007-05-19). Retrieved on 2013-03-19. ↑ "한국 10대 그룹 이름과 로고의 의미". Koreadaily. Retrieved 10 July 2006. ↑ "Speaker". Audio Branding Academy. Retrieved 2015-12-17. ↑ "Logo Video". Samsung-Youtube. Retrieved 2011-01-15. ↑ Chaim Gartenberg, The Verge. “Samsung developed its own font called SamsungOne.” July 25, 2016. July 25, 2016. ↑ "기업의 사회공헌 삼성그룹, 함께 가는 `창조 경영`... 봉사도 1등". www.dt.co.kr. Retrieved 2010-09-19. ↑ Roberts, Rob (2009-10-26). "AECOM Technology buys Ellerbe Becket". kansascity.bizjournals.com. Retrieved 2010-09-19. ↑ "Yokohama to become official shirt partner". Chelsea F.C. 2015-02-26. Retrieved 26 July 2015. ↑ The Olympic Games and Samsung. Ajw.asahi.com. Retrieved on 2013-03-19. ↑ Kim, Miyoung (Nov 27, 2013). "Samsung's marketing splurge doesn't always bring bang-for-buck". Reuters. Retrieved 21 October 2015. ↑ "Samsung Sponsorship - Sydney Opera House - Samsung". samsung.com. Retrieved 31 August 2015. ↑ "Samsung ist Namensgeber und Hauptsponsor". Frankfurter Neue Presse. 15 April 2016. Retrieved 4 May 2016. ↑ Choe Sang-Hun (6 November 2007). "Corruption scandal snowballs at South Korea's Samsung Group". New York Times. Retrieved 23 September 2013. ↑ Chico Harlan (9 December 2012). "In South Korea, the Republic of Samsung". The Washington Post. Retrieved 23 September 2013. ↑ AFP (15 April 2013). "Taiwan probes Samsung 'dirty tricks' vs HTC'". Google News. Archived from the original on 28 July 2013. Retrieved 27 September 2013. ↑ CNA (9 April 2013). "Samsung postpones Galaxy 4S debut in Taiwan". Want China Times. Retrieved 27 September 2013. 1 2 3 Reisinger, Don (28 August 2014). "Samsung supplier factory found to use child labor, watchdog says". CNET. United States. Retrieved 10 March 2015. ↑ "Another Samsung supplier factory exploiting child labor". ↑ "Cover-up involving underage workers at Samsung supplier alleged by labor group". ↑ "Antitrust: Commission fines DRAM producers € 331 million for price cartel; reaches first settlement in a cartel case". European Commission. European Commission. Retrieved 22 April 2012. ↑ "Canadian DRAM Class Action". themoneyismine.com. Retrieved 31 August 2015. ↑ "Samsung CLP-365w Laser Printer DIY Imaging Drum Unit reset".